On Saturday 1st June 2019 the gates leading to the Llanidloes Lawn Bowling Green will open for all those that want to have go at Lawn Bowls. There will be plenty of opportunities to roll some woods and get some coaching from experienced players and coaches. Weather permitting there will be refreshments, BBQ and , of course, the bar will be open. For more details contact the club secretary by e-mail or call in to the Club House any time after the start of the season on Sunday 27th April 2019. 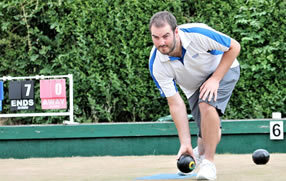 Established way back in 1913/14, Llanidloes Bowling club is situated in the historic town of Llanidloes on the main A470 North to South Wales Trunk road. To the South visitors will find the 72 square miles of stunning landscapes of the Elan Vally. The East follows the Severn valley to Newtown and Welspool. The West takes you past the river Wye and onto the sea at Aberystwyth. To the North stands the magnificent Pymlymon mountain, the source of both the rivers Wye and the Severn. The story of the Llanidloes Bowling Club began in the spring of 1912 when the "Llanidloes Town Improvement Association" gave, to the town, a recreation area. This area had already been donated to the Improvement Association in the year 1896 by an unknown benefactor. The only Clause being that it was to be self-supporting. A Recreation Society was then formed in the best interests of the area. The first use of the new ground was made by the croquet club who opened their lawn on Wednesday 12th June 1912 which was quickly followed by the Tennis Club which had already formed a Committee on the 28th May 1912. Members being L. Jones Williams, W. E. Dakin and E. Rogers. The Construction of a Block Golf Course was also being laid. Llanidloes Bowling Club host plenty of in-house competitions including Singles, Pairs, Mixed Pairs, Trebles and Rinks as well being affiliated to the Welsh Bowling Association, the Welsh Women's Bowling Association, the Montgomeryshire Bowling Association and the Mid Wales Women's Bowling Association. 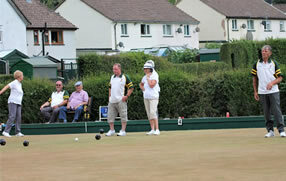 Most importantly Llanidloes Bowling Club members welcome all newcomers with open arms and make them feel at home. 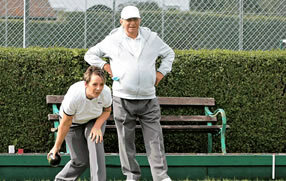 Amongst club members there are several coaches who will happily spend time with new players offering advice about Bowling and the equipment used. In 2018 Llanidloes Bowling Club had over 40 male, over 30 female playing members and around 30 social members. Most will play in the leagues ( with the exception of the new men and women who will hopefully progress to this ) and extenal competitions. Llanidloes Bowls Club has also been proud to have a few Internationals over the years and In July 2018 one of our younger female playing members represented Wales against Scotland, Ireland and England and in September another of our younger male members will also be representing Wales against Scotland, Ireland and England to be played in Ireland.